Sometimes I find something so basic and so obvious that I wonder why it hadn’t occurred to me sooner. I love sandwiches. I think America does great sandwiches… hello, (veg-friendly) barbeque riblets, cheesesteaks, pulled pork, and reubens! But England does great sandwiches in a different way. Of course they do… after all, sandwiches were supposedly invented by one of their people! Walk into any grocery store, and even sometimes a Boots pharmacy and there’s wide selection of reasonably priced pre-made sandwiches cut into triangles and packed in little cardboard boxes. Hit up a Mark’s & Spencer around closing time and they’re often half off. Have I mentioned how much I love England? Of course being England, there are plenty of veg-friendly options (more love! ), like cheese and onion which as far as I can tell is sharp shredded cheese mixed with chopped onions and a bit of mayo. Or a Ploughman’s… sharp cheddar and “pickle,” which is really more of a chutney than pickle. I love Branston Pickle almost as much as I love Robert. One time I had a bit leftover from one of our hotel picnics, so I figured I’d bring it back to Denmark in my carry-on. Excellent plan, except airport security considers Branston Pickle a “gel.” I know, right? So I finished it off with a spoon right then and there in the middle of Stansted airport! There’s also egg and cress, and egg, tomato, and mayo. The Ploughman’s is actually my favorite, but I have to ration my Branston Pickle supply between England visits. Still, egg, tomato, and homemade mayo with a bit of salt and pepper on whole grain bread is a very close second. 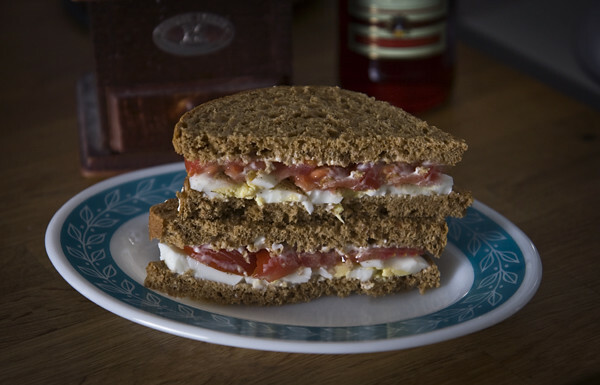 Often, the simplest things are the best, so if you haven’t tried an egg, tomato and mayo sandwich, what are you waiting for? P.S. I posted last month on my Facebook page about finding a little honor stand on the side of the road selling eggs from a family’s backyard chickens. There’s a definite difference in taste and quality between those eggs and supermarket eggs. They’re more flavorful, the yolks are much darker and have a better texture, and the eggs themselves are so big and beautiful! Now I buy all my eggs from that little stand. That sandwich looks exactly as described….simple and delicious! I don’t know if I understand what Branston Pickle is, though? My Dad would make these for me when I was growing up…sans the mayo! People think I’m crazy when I describe it…but sooo delicious!